Democratic strategists and pollsters see signs of a dramatic increase in the number of Hispanic registered voters turning out early in Florida. Florida's 2016 election is shaping up to be a watershed moment for Hispanic voter impact. A dramatic surge in recent months by Hispanic voters is becoming daily more evident in official early voting data, according to analysis by University of Florida political scientist Daniel Smith. "It very well could be the Hispanic vote that saves Hillary Clinton in Florida," said Smith, who tracks the state's voting patterns on his blog, electionsmith.com. "It's just been eye-popping the turnout by Hispanics," he added, citing data from early in person voting and voting by mail in Florida, the largest swing state which pundits say is a must-win for Republican Party candidate Donald Trump to have any chance of being elected president. Polls currently show the race to be statistically tied. The large turnout comes on the back of record voter registration by Hispanics in Florida this year. Smith's analysis found that nearly 23 percent of the 820,000 voters who registered this year in Florida describe themselves as Hispanic. While ethnicity is optional on voter forms, the number is way over the 16 per cent Latino share of the state's population. New white voters represented 52 percent of new voters, despite accounting for 68 percent of the voting population. As of Oct 1 Hispanics made up 15.5 percent of registered Florida voters, up from 13.5 percent in 2012. That does not include about 50,000 voters who registered late and about whom data is not available. 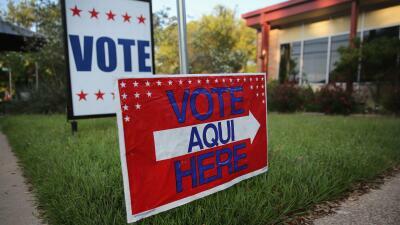 Smith estimated that there now 200,000 more Hispanic voters registered than in 2012. In 2012 Barack Obama defeated Mitt Romney in Florida by only 74,000 votes. Of the 186,000 newly registered Hispanic voters, Smith said 42 percent are Democrats and only 15 percent registered Republican. Another 42 percent did not register a party affiliation. Previously Republicans represented 26 percent of Hispanic voters in Florida. "That's a historic shift," said Smith. His analysis is backed up by Hispanic pollsters who see the same trend favoring Clinton over Republican nominee Donald Trump. “These Florida numbers are not only ominous for Donald Trump — they’re downright terrifying for Republicans nationwide,” Fernand Amandi, with the Miami firm Bendixen & Amandi, told Politico. Clinton is trouncing Trump by an historic 30-point margin (60 per cent to 30 percent) among Florida Hispanics, according to a bipartisan Univision poll this week. Clinton is getting a massive lift from new Puerto Rican voters who favor by a whopping 71 percent to 19 percent, according to the poll conducted for Univision by the Tarrance Group and Bendixen & Amandi International. In the heavily Puerto Rican county of Osceola in central Florida, just south of Orlando, new Hispanic voters made up 58 percent of newly registered voters since Jan 1. In Orange County, where Orlando is located, the number was 34 percent. Equally surprising were numbers in less Hispanic rural counties, such as Hendry (43 percent) and Hardy (33 percent), located near Lake Okeechobee with many Hispanic agricultural workers. Because ethnicity is optional on registration forms "studies have found that the real Hispanic vote is larger than the registration," noted Steve Schale, a former Obama campaign Florida strategist who writes a daily Florida election blog. "So while Hispanics might make up 14.2 percent of the voters who have voted so far, in reality, the number is larger," he added. Schale also noted that a high number of "low propensity" Hispanic voters who only voted in one of the last three elections. Conservative groups also recognize a Hispanic surge. The Libre Institute, a conservative Hispanic group funded by the industrialist Koch brothers, predicted Friday that Latino turnout in Florida for the Nov. 8 election will be 65.4 percent, up from 62 percent in 2012, about one-fifth of Florida voters, or 1.75 million people. In 2012 there were only 1.67 million registered Hispanic voters in total, with little more than one million who made it to the polls. As of Friday morning Hispanics had already cast 744,000 ballots. "Hispanics have already exceeded early in person and voting by mail by more than 200,000 votes," Smith said his analysis showed. It was possible that some of that early vote was "cannibalizing" Hispanic turnout on election day, he noted. "Hispanics tends to vote on election day so maybe they are shifting their voting habits," he said. "Even so, the numbers are huge." As of Friday more than 5.2 million ballots had been cast in Florida with Republicans registered voters ahead by less than 2,000 votes representing a 0.03 percent margin. "Right now, I think about 57 percent of the likely electorate has voted," said Schale. Orange and Osceola counties both out-performed their projected share of the statewide vote, Schale noted. "In other words, more people turned out there than you’d expect based on their likely proportion to the rest of the state," he wrote Friday. While Republicans were doing well elsewhere in the state, "I don’t think well enough to balance out what is happening in Orange and Osceola," he added.